Its architect was Maurice Salo. Construction began in 1940 and was completed in 1948 (with time out for World War II). The elevator, affording accessibility to all, was added in 1995. The organ, dedicated in 1954, has 2,078 pipes ranging in length from three-eighths of an inch to sixteen feet. Jerry Brown, our Director of Music, occasionally gives tours of the organ and pipes. The Ark that holds the Torah is for the Metropolitan Synagogue, which has met here since 1960. 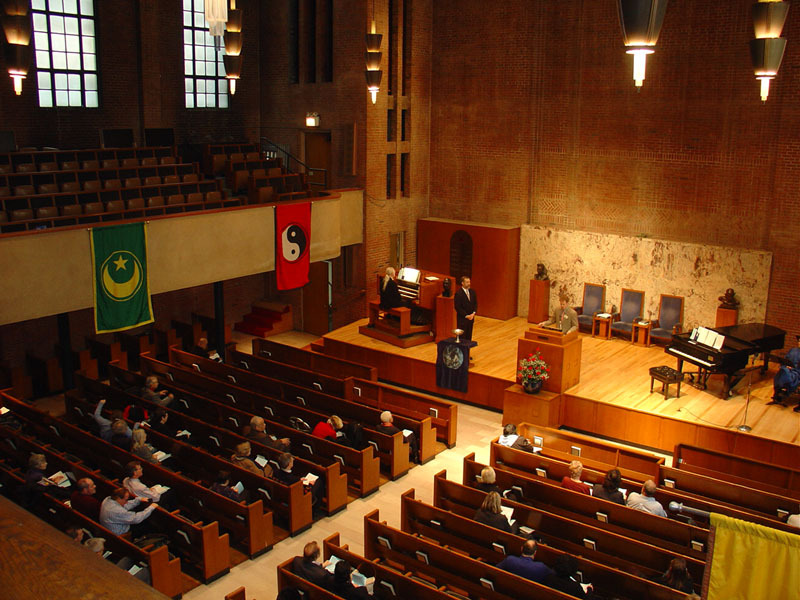 The church also hosts interfaith community worship services, peace rallies and social justice gatherings - in addition to weddings and memorial services for members and others (memorial services for Roy Wilkins and Bela Bartok, for example, were held here). The busts in front of us are those of some of our "saints": Gandhi, Albert Schweitzer, Margaret Sanger and Martin Luther King. If we look up, we see the balcony, which holds about 200. (The main floor will hold about 550 people.) In the summer, we hold services downstairs because it's air conditioned. Our regular Sunday attendance is about 150. The big box on the balcony is used to tape services which are broadcast over WQXR and on Manhattan cable TV, channel 56, at least twice a month. The memorial pews were offered at $300 each as a fund-raising project when the church was being built. In addition to memorializing loved ones, heroes were honored and visitors welcomed. The little black boxes under the seats are for heating. The windows are clear, in keeping with the design of the building, except for one beautiful stained glass window created in 1998 by Ellen Mandelbaum, a member of our congregation, to honor the memory of another member, John McKnight. * At the front is the Flaming Chalice of Unitarian Universalism. * We also have the Whole Earth flag on the table that holds the chalice we light for every service. It represents the grandeur and beauty of nature and the oneness of all life on earth. The piece of art on the North wall, "Suffer the Children," is a gift of the artist Greg Ridley, a New York artist and professor at Fisk University. * As we approach the back of the church, we see busts of some of our other "saints": Abraham Lincoln, Ralph Waldo Emerson, Walt Whitman - and a photograph of Nelson Mandela, taken when he spoke here in June of 1990, after his liberation from prison. The American Committee on Africa, the oldest anti-apartheid organization in the country, was founded in 1952 at our church. Moving out onto the veranda, we have a nice patio for summer "Fellowship hours" after Sunday services. * The elevator has this level as it's top floor, with exits here and into the sanctuary. The next stop down is street level and the bottom level opens onto the ground floor, where the Assembly Hall is, as well as the "accessible" bathroom. The glass-encased box on the wall by the stairs holds "A Church of the Free Spirit," another statement of who we are. On the front of the building is the statue of Isaiah and the "...swords into plowshares..." quote. The church also owns the adjacent four brownstones, which house our ministerial staff, our Guest House Off Park, one tenant and our men's shelter. The middle two brownstones are joined, and the rooms are used for adult religious education and fellowship, for a weekday tenant (the International Preschool) and for many committee meetings and circle group gatherings during the week. In the back is a playground. The Chapel is used for some memorial services and other small group gatherings. (Our Good Friday Tenabrae service is held here.) The statue on the alter is of St. Francis of Assisi and under the alter are the remains of Vilma Harrington, first wife of our Minister Emeritus, and ashes of several others, named along the south wall. Our downstairs rooms hold our Sunday School. The Youth Group meets in the Conference Room, around the corner from the accessible restroom. Next to it is the kitchen, then a small workroom for the sexton and church building staff. The stairs lead up to the men's room and the women's room is next to the stairs. Then we come to the newly created Church School rooms: a bright, cozy nursery and our "Way Cool Sunday School" room, with tables for children of different sizes and a large play area. Next to the Church School rooms and across the way, next to the elevator, are rooms for the church administrative staff. The Assembly Hall in the center of the downstairs area is where you get to meet and greet and visit the sign-up tables and the bookstall and have coffee or juice or something light to eat. The paintings are of Dr. Donald and Vilma Harrington and John Haynes Holmes. This church is the second Unitarian congregation in New York City, founded in 1825 and taking the name, "The Church of the Messiah." * In 1879, Robert Collyer (bust outside sanctuary) became minister and turned a struggling, debt-laden church into one of wealth and fashionability. * In 1907, John Haynes Holmes arrived and declared the church, "a chapel for the rich." In 1919 he became Senior Minister and oversaw another transformation. 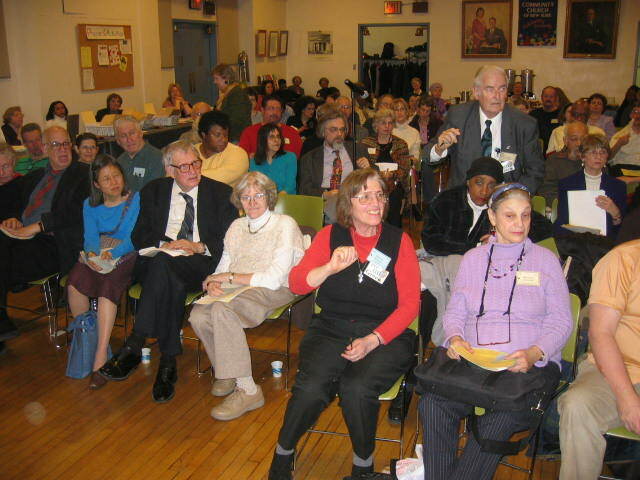 The church changed its name to "Community Church of New York" and became more diverse racially and economically. His ashes and those of his wife, Madelaine Hosmer Holmes, are buried under marble in the aisle, where their initials are seen. In 1949, Donald S. Harrington, our Minister Emeritus, became Minister and led the congregation until our current minister, Bruce Southworth, became Senior Minister in 1982. Robert Collyer -- Born into poverty in England, a 14-hour-a-day laborer in a cotton mill from the age of 8, he was apprenticed to a blacksmith at age 14. After his first wife died in childbirth, he developed a religious sensibility and eventually became a Methodist lay preacher. He remarried and immigrated to the United States, where he heard a Quaker anti-slavery crusader, Lucretia Mott, and joined the abolitionists. His eloquence caught the attention of Unitarian leaders, who invited him to head a ministry to the poor in Chicago. He later became a speaker on the lecture circuit and eventually the minister of the new "Church of the Messiah" in New York City. John Haynes Holmes -- Famous minister and speaker. A founder of the NAACP and the American Civil Liberties Union. Much about him is available at the bookstall downstairs. Elevator -- Designed by AIA Gold Medal winning architects Mitchell/Giurgola. The terrace was shortened to include this addition and the circular window awaits a flaming chalice. Banners -- We honor the heritage of Universalism by celebrating many major holidays of the world's religions. Judaism - We have a High Holy Day Sunday between Rosh Hashanah and Yom Kippur, a Menorah lighting during Hanukkah and an annual Seder. Christianity - We have the annual "Messiah" concert, a Palm Sunday service, the Good Friday Tenabrae service in the chapel and celebration of Easter, which includes an earth celebration of nature's renewal as well as spiritual rebirth. Islam - During Ramadan and several times throughout the year, we hear wisdom from the Koran and note the Muslim concept of "original sin" as "forgetfulness." Buddhism - We observe Wesak Sunday, celebrating the birth, enlightenment and death of the Buddha, usually in April or early May, depending on the lunar calendar. Hinduism - We have a delightful festival of lights for Divali in the fall. Taoism - No particular celebration, but ongoing references to the wisdom of balance in our lives and in the universe. We also have a Kwanzaa service in December, earth day celebrations and have had Native American Indian speakers and dancers. Flaming Chalice -- It has been the symbol of Unitarian Universalism since World War II, when it was adopted for relief efforts by the Unitarian Service Committee. It symbolizes democratic congregational life, spiritual freedom, the light of knowledge and courage - drawing upon the life of Jan Hus, who was condemned for heresy by the Roman Catholic Church. He advocated sharing the communion chalice with the entire congregation. Whole Earth Flag -- It represents human interdependence and the oneness of all life on earth. It speaks of an earth-centered, creation-centered spirituality. Nelson Mandela -- He chose to speak here because of this church's history of anti-apartheid activism. The African National Congress and ACOA (now called Africa Action) had their first offices in one of our adjacent brownstones. More than a dozen church members were arrested for civil disobedience in the 1980s. Rev. Southworth went with other clergy to South Africa in 1990 and as an election observer in Soweto in 1994.